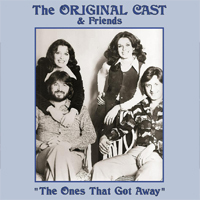 TONY BURROWS, DAVID MARTIN and SUE & SUNNY formed in the mid ’70s ORIGINAL CAST who released their epic “First Night” single to great critical acclaim. All the group members were well known in their own right with TONY BURROWS having sung lead vocal on “Love Grows” EDISON LIGHTHOUSE (1970 UK number 1), WHITE PLAINS UK 1970 Top 10 hit single “My Baby Loves Loving” and also as THE PIPKINS ”Gimme Dat Ding” –UK 1970 number 6. DAVID MARTIN was a successful songwriter with his songs being recorded by The Carpenters, Barry Manilow (“Can’t Smile Without You”), Elvis Presley to David Essex. He also found time to form a band with his song writing partners called BUTTERSCOTCH who made UK Top 20 in 1970 with “Don’t You Know”. David also was lead vocalist for the single “There’s A Whole Lot Of Loving” by GUYS and DOLLS (UK number 2, 1975). SUE and SUNNY were in demand session singers performing in the studios with ELTON JOHN, MOTT THE HOOPLE, JOE COCKER, DAVID BOWIE, MARC BOLAN, DONNA SUMMER to countless others. Sunny even had a hit single “Doctors Orders” in 1974-UK number 7. 19 tracks from the ’70s on this album plus a bonus track of “Golden Yearz” written by David Martin recorded in 2016 and featuring David, Tony and RON DANTE (lead singer THE ARCHIES). Tony Burrows, David Martin and Sue & Sunny formed The Original Cast in the mid-70s, all were well-known in their own right...There are 19 tracks from the '70s on this album plus a bonus track, recorded this year, featuring Ron Dante, who was lead singer on The Archies' number one hit 'Sugar Sugar'. ...the hour-long collection, featuring some lesser known recordings that heavily enlist a 'revolving' team of stalwart recording studio denizens (also including backing-singer sisters Sue & Sunny), is largely made up of catchy sunshine pop - not least the late-70's original 'Summertime' by 'the West End Boys', which is very reminiscent of the aforementioned 'Beach Baby'. ...this album was created to shed light on the music created by Tony, David, Sue, and Sunny. If you love the light and sunny 1970's pop sound that can be found on the Rhino Records Have A Nice Day various artists collection, The Ones That Got Away will be right up your alley. These nineteen tracks are sure to take you back to another time and place when music was simpler and folks weren't quite so sarcastic and jaded about everything. To bring things full circle, the album closes with a new track recorded in 2016 that includes vocals by Ron Dante (of The Archies). A fascinating journey into the music of four exceedingly talented artists. I can tell you that a lot of the tracks on this new 20 track CD are rare and hard to find and if you enjoy pure pop put together impeccably there is a lot to enjoy, its perfect summer time sunny day listening. And the final track 'Golden Yearz' is a little stroke of genius, recorded this year and featuring Tony B, David M and the USA's 'equivalent' of Tony Burrows in the shape of Ron Dante the 'voice' behind The Archies 'Sugar Sugar', The Cufflinks 'Tracy', 'When Julie Comes Around' and a host of others. An inspired idea, a hell of a catchy song, and proof (if it was needed) that these guys have lost none of their vocal prowess 4 decades on, love it! Think seventies, think of the timeless memorable sounds of White Plains, Guys And Dolls, Edison Lighthouse, and you know what musical direction this goes in. Tony Burrows has long been noted for decades as the best pop singer, and there are great songs here. "Love Matters" from the Original Cast is a nice love song while Tony Burrows' "Better Fly Butterfly" is a more solid pop track. Sue & Sunny provide strong vocals which can be heard clearly on "Ain't That Telling You People" which appeared in 1976. "Oh My Jo" by Tony Burrows takes me back to nice memories of the golden early seventies.